Lack of snow in the Rocky Mountains and an imbalance between water supply and demand has caused Lake Mead outside Las Vegas to drop for more than a decade. The latest U.S. Drought Monitor shows the Colorado River watershed's worsening dry conditions. Parts of California, Arizona, Colorado, Utah and New Mexico reported record dry conditions and high temperatures during the important snow accumulation period from November through January. The measly snowfall translates to worsening drought conditions. 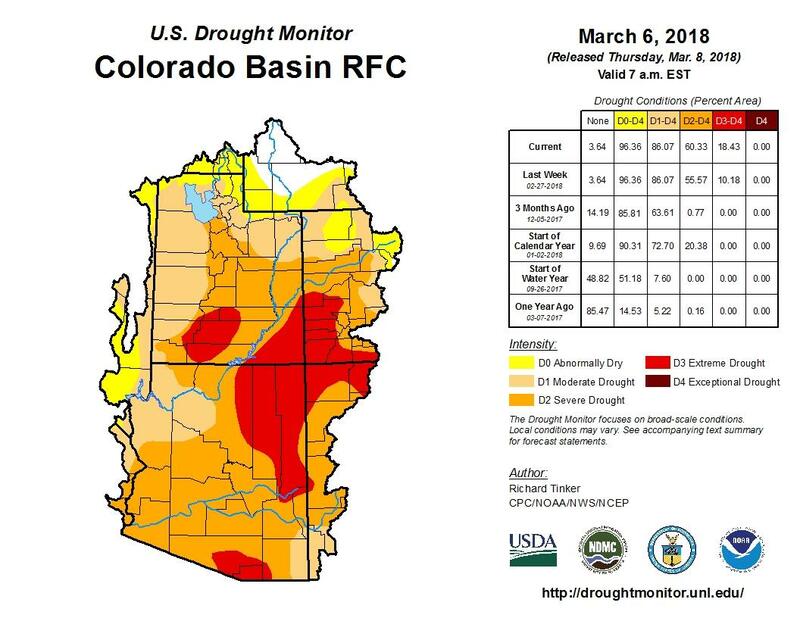 The U.S. Drought Monitor shows more than 60 percent of the Colorado River Basin classified as being in “severe” drought or worse, felt acutely in the Four Corners region, southern Utah and northern New Mexico. Projections for the amount of water the Colorado River and its tributaries will dump into Lake Powell, the Upper Basin states’ main water bank account, continue to drop. 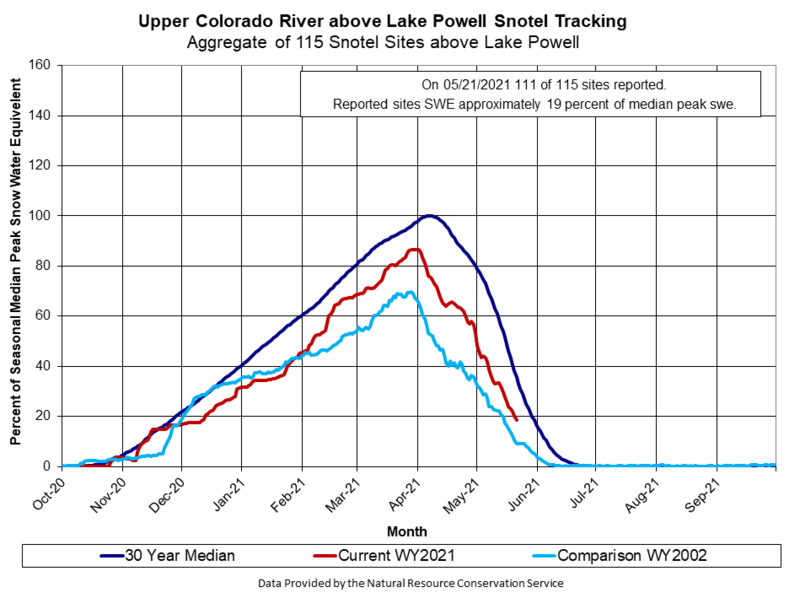 Without heavy spring snow in April and May, runoff to Powell will rival 2002’s trickle. Rivers and small creeks in southwestern Colorado and eastern Utah are projected to flow at 28 to 65 percent of their average spring flow. In Colorado’s mountains, it would take 327 percent of normal snowfall to pull the state’s measly supplies up to reasonable levels. 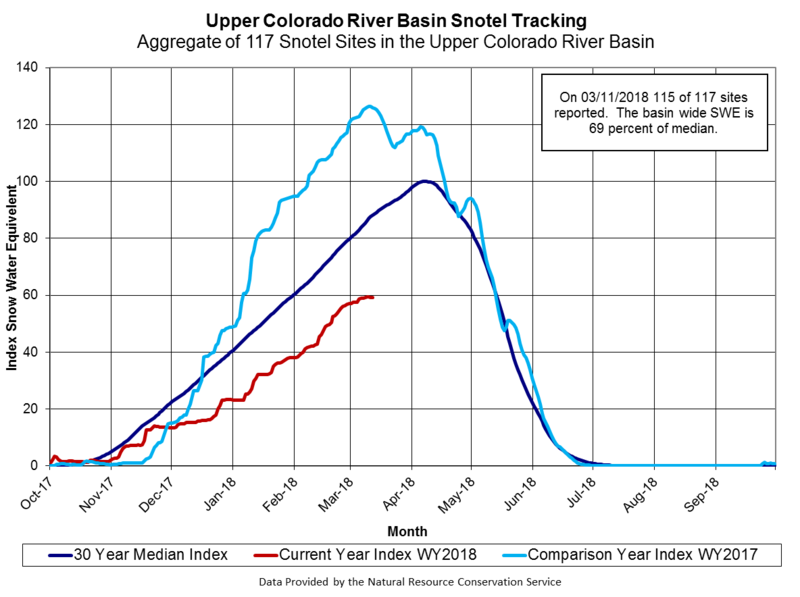 Upper Colorado River Basin snowpack lags well below the median for spring snow levels. And as scientists at the Colorado Basin River Forecast Center put it in their latest monthly forecast presentation: “Climatologically, time is running out,” to make up the deficit. So how does all this grim news likely translate into action? In Utah, the state’s Republican governor Gary Herbert sent out a letter to interfaith leaders asking for additional prayers to summon snow clouds, saying a previous call for providential help brought rains to quench Utah’s damaging wildfires in 2012. Facing an almost certain shortage on the Colorado River, water officials in landlocked Arizona are beginning to entertain investments in desalination, a technology once thought too expensive to make feasible on the coast let alone to pipe treated water inland. And across the Colorado River Basin, conservation groups will continue the drum beat for the Drought Contingency Plan, or something similar. The multi-state agreement is an update to a set of 2007 guidelines already deemed obsolete in responding to the 18-year drought that’s upended conventional wisdom about what’s possible in southwestern weather. But due to intrastate bickering and the inability of some major water users to come to the negotiating table, the deal looks far from finished.